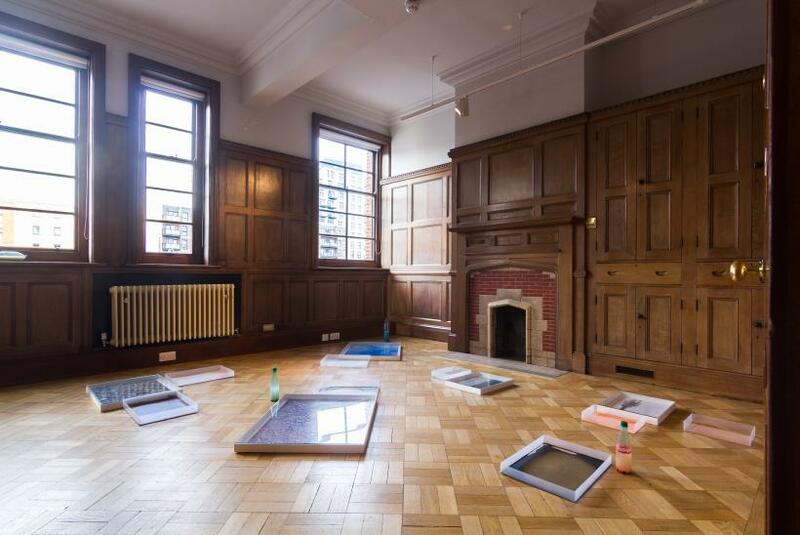 The expanded field of painting has been the subject of a host of recent exhibitions, not least Sarah Kate Wilson’s 2012 touring project ‘Malerei; Painting as Object’. No longer constrained by the wall, the stretcher or the medium of paint itself, much painting discourse has become focused around ideas of materiality, process, and the objecthood of the resultant work. 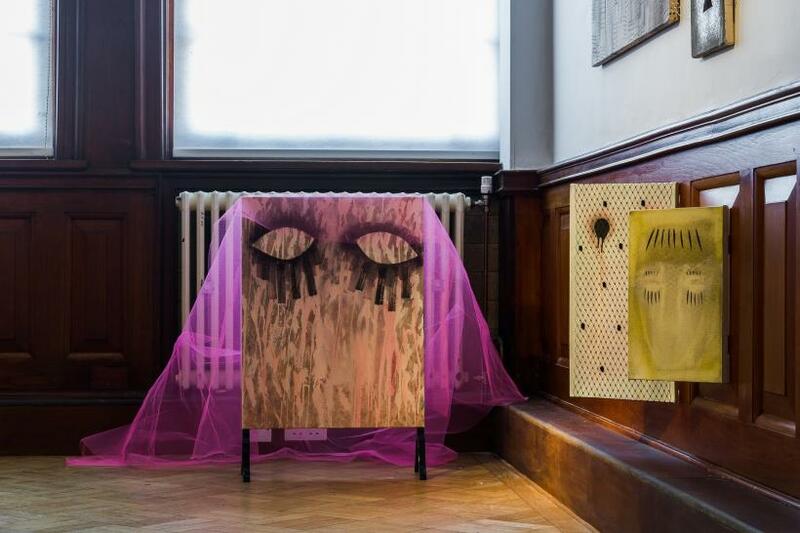 Whilst we have become accustomed to the idea of painting masked as sculpture or made through performance, the current exhibition at The Tetley investigates the relationship between time and contemporary painting, staking a claim for painting as a time-based medium. Frank Stella recognised a disparity between the fluid, malleable and vibrant material of paint and the frequent flatness of the resultant painting: a need to ‘keep the paint as good as it was in the can.’ Recognising ‘paint’ as both a material and an ideal brimming with infinite potential, ‘Painting in Time’ presents a series of works that exist, in their potency, in temporarily varying stages of flux. 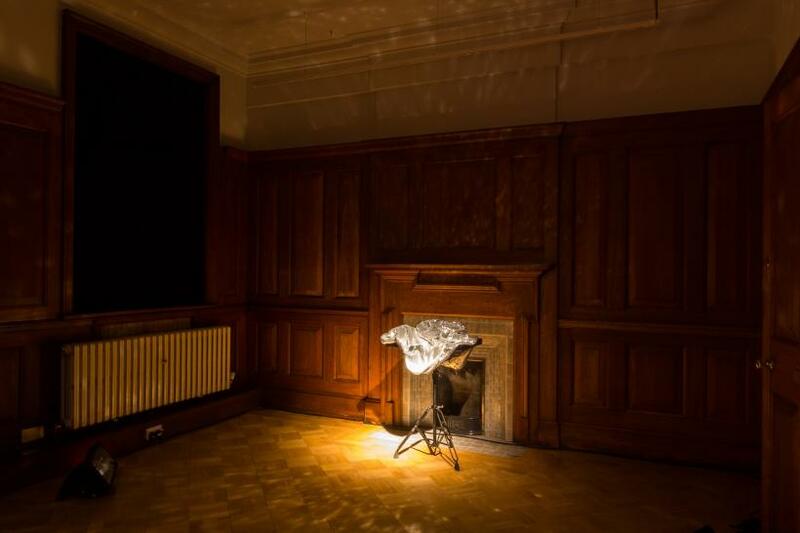 A pairing of works by Rob Leech explores the physical state, the essential wetness, of paint. In the first, a video, a warning sign – WET PAINT- ascribed on a piece of paper flaps in the wind and rain. We don’t see the actual painted surface it indexes, but the sign becomes the signifier for the essential volatile, unstable state of becomingness of paint. In the second, ‘Paint Can’, a pot of perennially wet paint bubbles and gurgles. 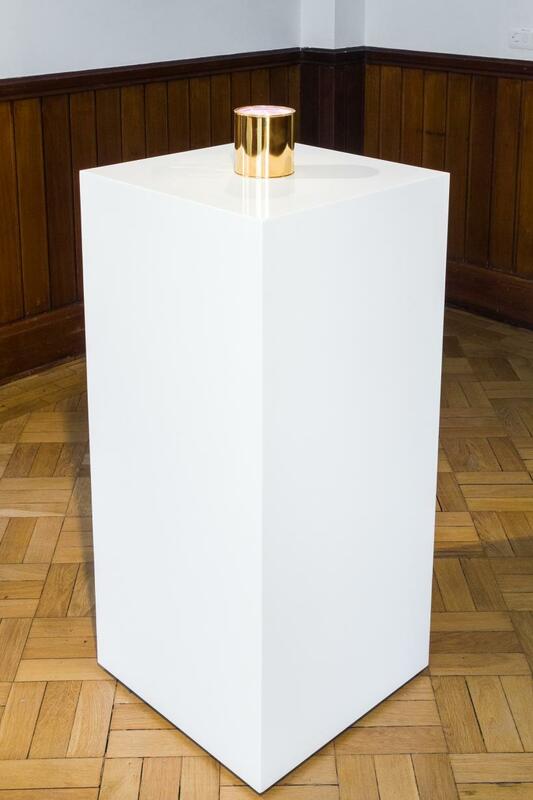 Placed on a plinth, the golden can filled to the brim with the pigment-rich emulsion is a pure celebration of the medium and its potential. 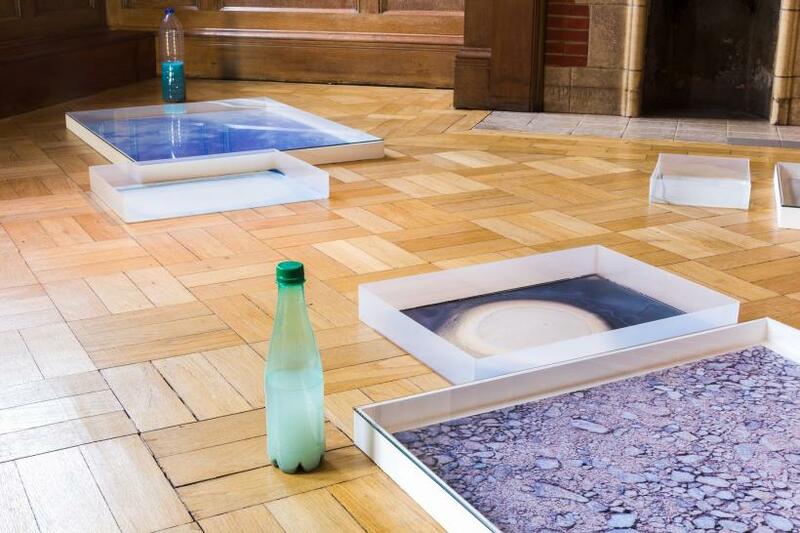 This liquid transitional state is elsewhere celebrated in live works by Natasha Kidd and Sarah Kate Wilson. In Kidd’s kinetic sculpture, a vat of white emulsion is pumped around a looped system of piping. 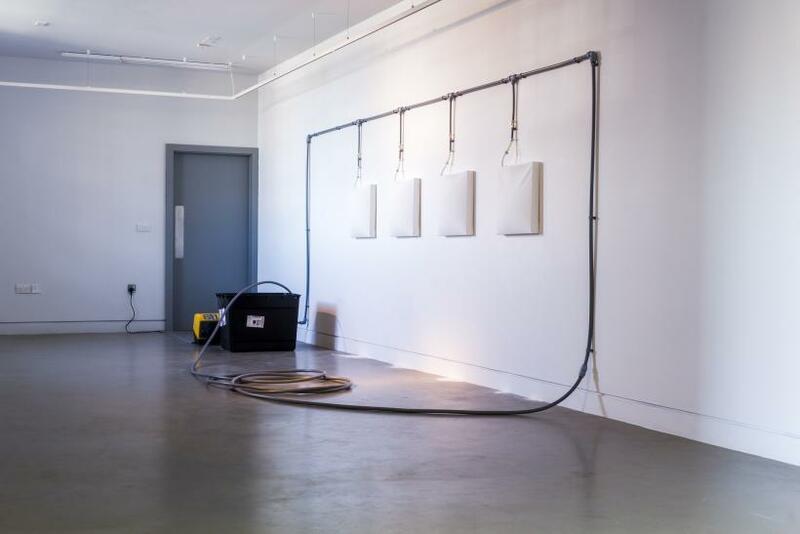 At interim moments the gallery assistants open valves in the network, discharging small amounts of paint onto a series of wall-mounted canvases. As paint dries on the surface of these monochrome paintings the transitional time signature of paint is marked and amplified. Similarly durational, Wilson’s ‘Zumba’ (2014) is a fifteen second performance enacted by the gallery staff. 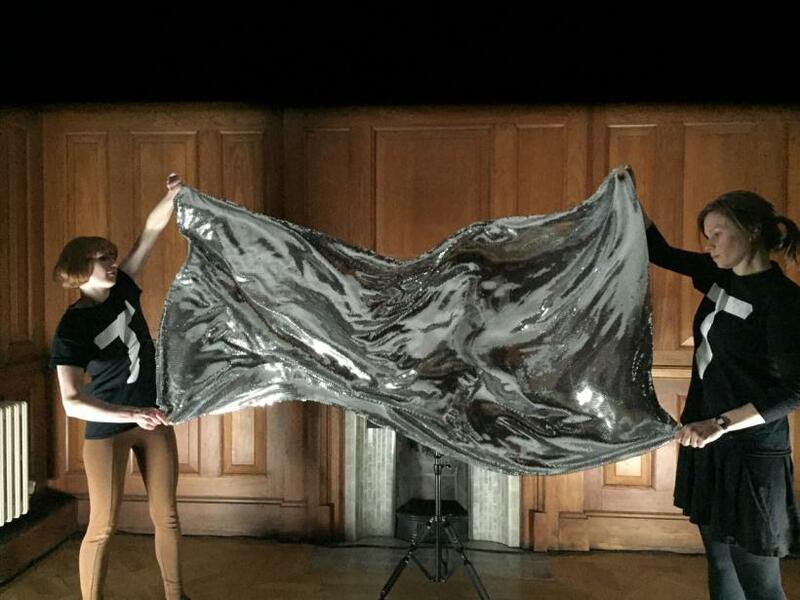 Bathed in strobe lighting, two assistants hold a rectangle of sequinned fabric that frenetically shimmers in the oscillating light. In effect, for that moment, the enlivened surface of the painting becomes, wet. The Tetley as a building couldn’t be further from the neutral white cube gallery. Its small wood panelled offices and large unruly and misshapen vestibules are like a labyrinth, but ‘Painting in Time’ isn’t your typical painting show either, and in their difference, they both perform well for each other. 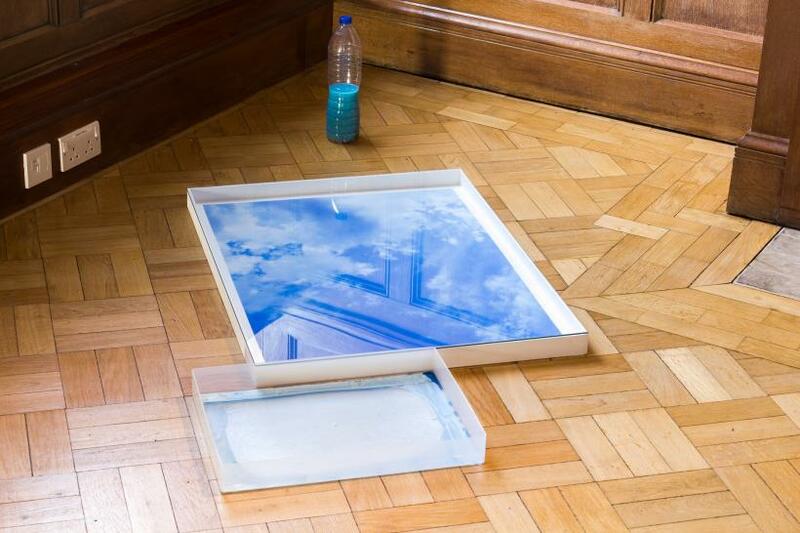 In the triple-height Atrium Gallery, works by Claire Ashley and Jessica Warboys can both be explored up close and seen from differing angles as you move through the building. 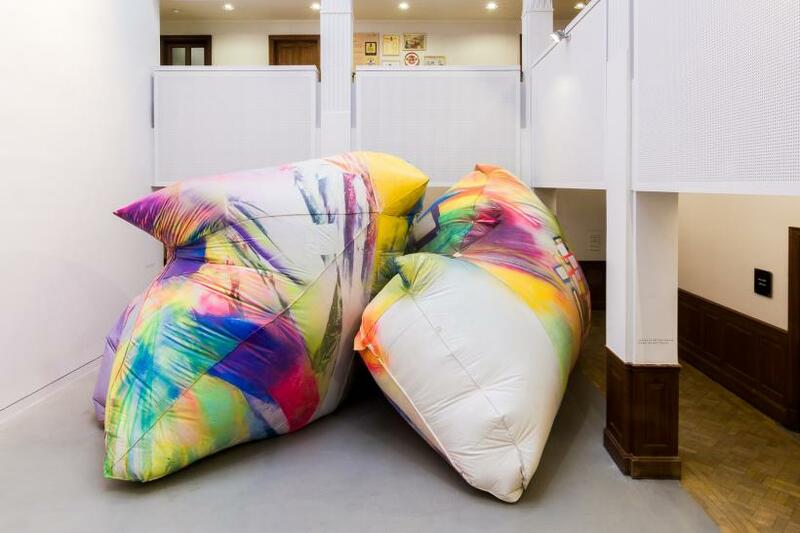 Ashley’s giant inflatable paintings slowly inflate and deflate, obscuring and revealing elements of their surface and form as they evolve. Always moving, never still, never finished and never the same, next to Ashley’s installation Jessica Warboys’ freestanding stackable paintings are more static assemblages. Yet in their latent structure we know the current configuration could be changed in an instant. Their permanence or finish is also a temporary conclusion. Laid out over a series of long trestle tables Polly Apfelbaum’s fallen paintings similarly free painting from the wall and challenge our expectations of finish. It could at a glance be the beginnings of a children’s workshop in which these are the raw materials, but we aren’t invited to touch or play, these are Apfelbaum’s materials and they have been meticulously arranged. Upon the surface of the slabs of brightly coloured plasticine piles of glitter sparkle and glint. The works aren’t fixed, their fragility is evident but it enhances their luster. Apfelbaum’s works are a celebration of materials, a eulogy to colour, and a monument to temporality. They can’t be kept, owned, or re-circulated, they are indexed to the duration of the show. 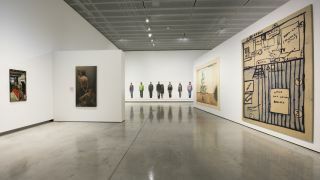 ‘Painting in Time’ is fundamentally an exhibition designed to evolve: to finish a different show from the one that first began. Viewers are frequently asked to participate in this process of change, not least in works by Yoko Ono, Kate Hawkins and Lisa Milroy. 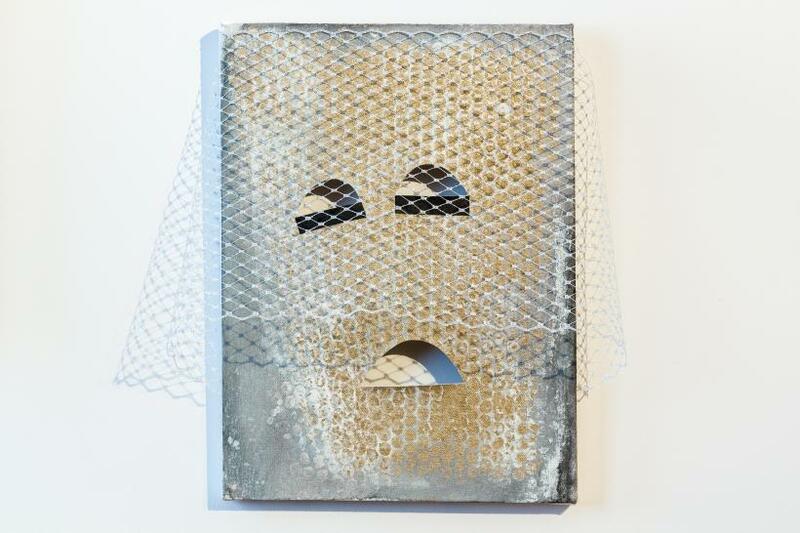 Ono invites the viewer to hammer a nail into a toilet, Hawkins employs hinges as wall fixings allowing viewers to reconfigure the hang of her paintings and Milroy’s modular two-sided paintings can be moved and interchanged. Elsewhere, in a work by Kristina Buch our participation is solicited more through implication than intentional contribution. Covertly placed on the floor by an external door, Buch’s painting is a doormat and is as such marked and trampled by viewers feet. 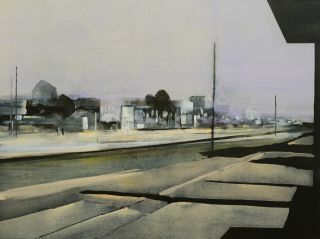 Like many of the other works it makes an aggressive challenge to painting and all its tropes. ‘Painting in Time’ not only drags painting off the wall, but presents it as an interactive, touchable, participatory medium, evolving through human interaction, resulting in its ties to permanence being rigorously challenged.